The stock market ebbs and flows with shifting financial conditions… as the tide ebbs and flows with the moon’s shifting humors. We are informed — reliably — that financial conditions in late 2018 were the tightest in 2½ years. 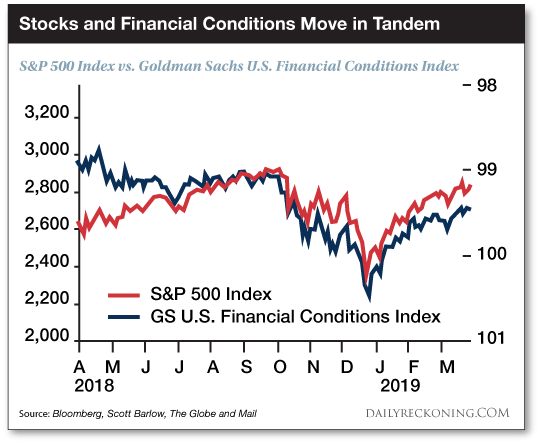 If I could only pick one chart to highlight the main drivers of market volatility over the past six months… it would be the comparison of the S&P 500 and the Goldman Sachs U.S. Financial Conditions Index. By late December Wall Street rose in riot. And stocks verged upon a bear market. But the Federal Reserve laid down its arms, hoisted a white flag of surrender… and beat its swords into plowshares. No rate hikes this year, it effectively announced. And quantitative tightening would end by September. The stock market subsequently put in its loveliest quarter in nine years. And financial conditions have once again eased into relaxed accommodation… as easy as a streetwalker’s virtue. In fact, we are informed that financial conditions are the loosest in five years. By one metric they are the easiest in 25 years. The Chicago Fed’s National Financial Conditions Index (NFCI) provides a comprehensive weekly update on U.S. financial conditions in money markets, debt and equity markets… [It summarizes] different financial indicators and, because they measure financial stress, can serve as a barometer of the health of financial markets. 1. Risk Subindex. This looks at volatility and funding risk in the financial sector. 2. Credit Subindex. This looks at measures of credit conditions. 3. Leverage Subindex. This looks at debt and equity measures. Any reading of zero or above is a warning of coming financial weather. Roaring bear markets commenced in 1973, 2000 and 2007 when the index crossed above zero. 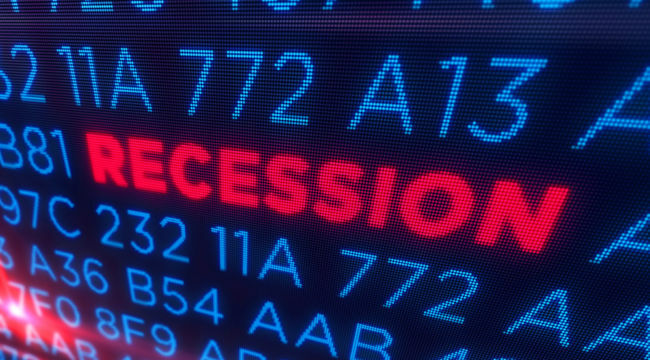 Economic recessions are also in prospect when the index exceeds zero. Substantially positive readings accompanied the deep recession of the early 1980s, for example. 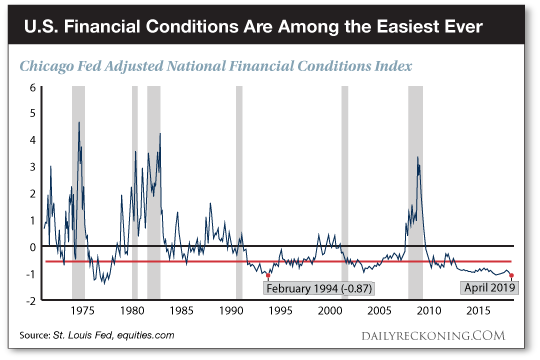 When the National Financial Conditions Index is below zero — on the other hand — it indicates easy waters ahead. What is the index’s latest reading? It is the lowest reading since February 1994… long before quantitative easing twinkled in Ben Bernanke’s beady eye. Should we be surprised that the stock market has gone on a beautiful spree since the Federal Reserve’s epic surrender? And can we conclude that stocks are presently free to run amok? No, we cannot, says Adem Tumerkan, editor-in-chief of SpeculatorsAnonymous.com. Recall, the NFCI features a leverage subindex, a barometer of debt and equity. For starters — it’s a leading indicator (any economic factor that changes before the rest of the economy begins to go in a particular direction). And secondly — since we live in a credit-based world… leverage is what drives the boom and bust cycle. When leverage is cheap (low rates), people borrow more than they should and bid up riskier assets — pushing prices higher (the boom phase). But when leverage is expensive (higher rates), people borrow less — and even liquidate riskier assets to pay back debts — pushing prices lower (the bust phase). What is the leverage subindex telling us today? That leverage is far tighter than one year ago. Late last March the index gave a reading of negative 0.61. But as of late March 2019… it read negative 0.26. Still below zero, that is. Still easy, that is — but substantially tighter than one year ago. This indicates that the cost of leverage is becoming much more expensive. And… could signal the end of the debt cycle as this trend continues. We stagger under the very contemplation of it. Debt cycles invariably end in tears. And given the Himalayan scale of the present debt cycle, it will likely end in shrieking, agonized sobs. Corporate, government and household debt have increased 50% over the past decade alone. That is, the existing system rests precariously upon creaking foundations of debt. One good shake could bring it all crashing down in a heap — as Humpty Dumpty from his wall.